I used this mold a few weeks ago for a vacuum bagging video and remembered this old post from 2015. It is a great quick demonstration of the process of building a plug, then infusing a mold, and then making prepreg carbon parts in an autoclave. Figured I’d share it. It has a bunch of carbon sinks. Two layers of 1oz chopped strand in polyester resin mat to support the paste. Polyester tooling paste applied and machined to the final shape. The plug gets primed and brought up to a shiny finish. 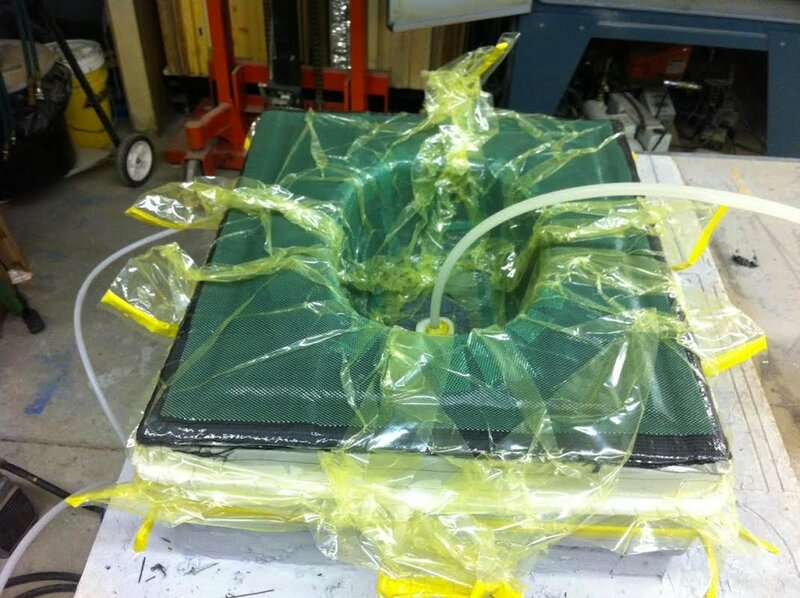 A carbon/epoxy mold is infused for the sinks using a high temperature tooling resin and then post-cured. The infused mold is post cured off the plug and prepared for laminating. Carbon prepreg is laminated over the mold. Here the first layer is being heated and stretched to cover the bowl in one piece. The laminated part is cured in the autoclave. Just using a non-perforated release film and breather so no resin is bled off during cure. These will be under-mounted, so the perimeter is masked off. I never saw them installed - hopefully they look shiny! This is a polyester tooling paste (ATC T-28) dispensed from a drum. It makes very nice plugs and molds but the process is time consuming and is not worth it for small parts. I would choose to make things this sized out of urethane tooling board. There is a point at which the total cost of a paste based system with its cheaper volume passes tooling board with its faster time to surface but more expensive volume. My guess is that the lines cross somewhere around the size of a couch!